In a state where the flagship university’s mascot is a fighting gamecock, some legislators are trying to toughen the penalties for cockfighting, something that’s illegal in all 50 states. But South Carolina is among nine states where the crime is only a misdemeanor, according to the National Conference of State Legislatures. Legislation considered Wednesday by a Senate panel would make second and subsequent convictions a felony, punishable by up to a $3,000 fine and five years in prison. Animal-rights activists say cockfighting is cruel, a haven for gambling and drug use and desensitizes children who might watch it to violence. But game fowl breeders contend cockfighting is a centuries-old tradition that’s no more cruel than hunting sports, and that breeding the birds is a source of pride…. … reminded me of a old grainy photo I recently ran across while digitizing family pictures. It’s not much to look at, not least because of its Polaroid-level quality. 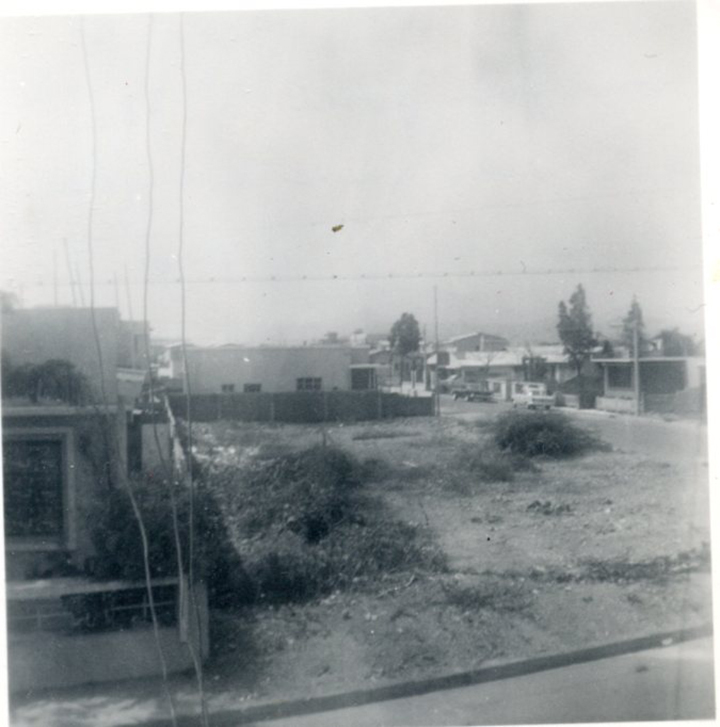 My mother was taking pictures around our house (actually, the spacious upstairs part of a duplex) where we lived in Guayaquil, Ecuador, from 1962-65. By the notes she wrote on the backs, she sent them to relatives in the States to show them where we lived. This is an ugly vacant lot across from porch “B”. The trash man comes every day & if he has a lot of paper he burns it there. You can barely see one of the dry mountains in the distance. Not much to see, but whenever I read about the cockfighting issue in the paper, I think of that lot. It was the only undeveloped lot within blocks of us, and therefore something of a magnet for my buddy Tony Wessler (an Air Force brat who lived about six blocks away) and me. We lived a fairly adventurous, Huck Finn life outdoors, since there was no television to speak of. There was little of nature there, as the houses didn’t have yards — just courtyards surrounding by walls that were only a yard or so from the houses. Tony and I would cross blocks by running along those walls and, where feasible, climbing from the walls to the flat concrete rooftops and running over the actual houses. See that house to the left of the vacant lot? We almost got caught on that one. The roof was divided for some reason by a cement wall about three-feet high. Vaulting it, I banged my knee right on the funny bone and collapsed on the roof. The resident heard us and called out, “Who is that?” Fortunately, we managed to get over to the next roof before he caught us. Anyway, unpaved ground was a rarity, and we liked this bit of it. One day on that lot, we saw a tight circle of men gathered in excitement around some activity in the dusty middle. These were working-class men, not the sort who lived in this relatively affluent part of town. Maybe one was that trash man my mother mentioned. Others could have been the pushcart vendors who worked our neighborhood, calling out the varieties of bananas and other produce they sold. We could barely make out what had them so excited, but we caught brief glimpses of the two gamecocks going at it while the men yelled, gesticulated and placed their bets. We wanted to get a better look, but couldn’t. I suppose this “desensitized” me as a child, because I don’t look back in horror. And the idea of chickens fighting doesn’t appall me the way, say, dogfighting does. Maybe because I have some empathy for those guys who didn’t have a whole lot of entertainment in their lives. Or maybe because daily, coming down Sunset between home and downtown, I find myself caught behind those miserable, smelly trucks carrying hundreds of filthy-looking white chickens on their way to the slaughter. Talk about desensitizing… giving a chicken a fighting chance seems less cruel by comparison. Before “stand your ground,” was there such a thing as a “run to the wall” law? This entry was posted in Confessional, Gambling, Personal, South Carolina, Sports, The World, Travel on March 3, 2016 by Brad Warthen. I wrote this post before. And I just went back and looked, and I actually wrote it better that time. And y’all engaged the topic last time, most of you taking me to task for my lack of proper regard for the rights of chickens. I hang my head for having forgotten (I thought I’d beat Bill to the punch with that link). Y’all probably remembered. Really, the only thing new in this post was finding that grainy photo of the dusty lot where I saw the cockfight. That, at least in my book, was worth sharing. It’s kind of fun to find photographic evidence of a dim memory.